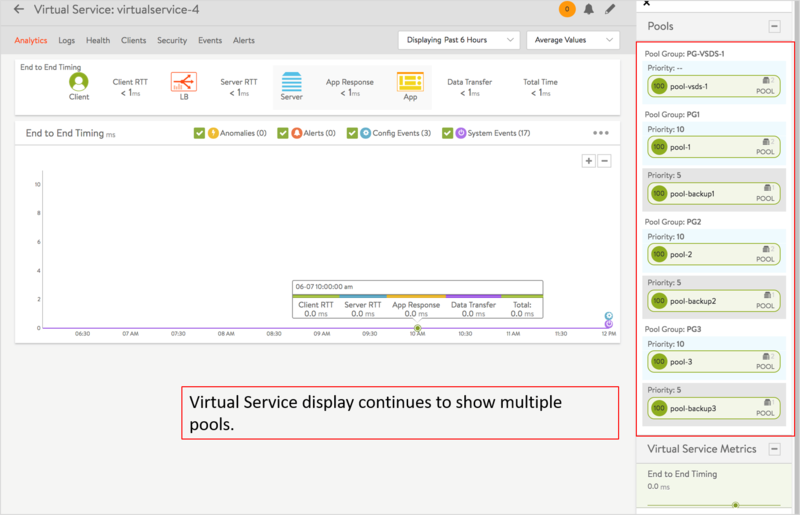 Starting with release 18.12, Avi Vantage supports the sharing of pool groups across multiple virtual services. The feature supports use cases wherein the same back-end servers are being used by different virtual services, each virtual service having its own purpose and properties. A pool group is a list of member (server) pools, combined with logic to select a member from the list. Like a pool, a pool group can be shared by the same type of Layer 7 virtual service. This article explains the feature’s capabilities, its CLI interface, and lists use restrictions. As the default pool group defined for a virtual service. A pool group can be referenced by multiple virtual services. In accessing the shared pool group, each virtual service can independently use any one of the multiple techniques listed above. As before, a virtual service may access multiple pools, some of them shared and others not. 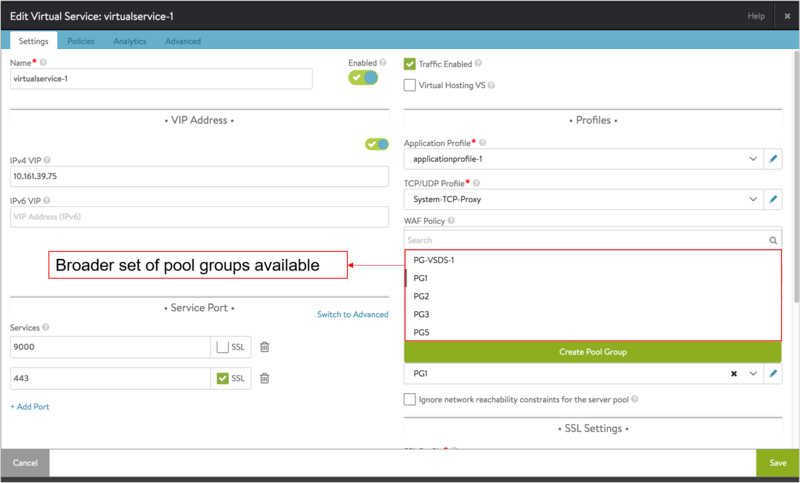 Virtual services sharing a pool group need not be placed on the same SE group. These are some restrictions when sharing a pool group. Layer 4 virtual service cannot share a pool group as yet. A pool can be part of multiple pool groups either through the same virtual service or different virtual services. The same pool group cannot be referred to multiple times in a pool group. If pool or pool group is selected using a service_port_selector, then it can’t be shared. Pool groups cannot contain pool groups. A pool directly linked to a virtual service should not be part of a pool group. Note: Some of these restrictions may be removed in the future releases. There is an increased number of pool group choices when configuring a virtual service. There are more ways to extract pool-related information when querying for statistics. Click on the edit icon against the required virtual service. Select Pool Group in the Edit Virtual Service: screen. Select the required pool groups from the list. The Edit Virtual Service: screen appears as shown in the following figure: Note: You can create a pool group by clicking on Create Pool Group or navigating to Applications > Pool Groups > Create Pool Group. To know more, check the Configuration section in the Pool Groups KB. The selected pool groups are now assigned to the required virtual services. With pool group sharing, you can see there is a broader set of pool groups available. Click on the View VS Tree filter. 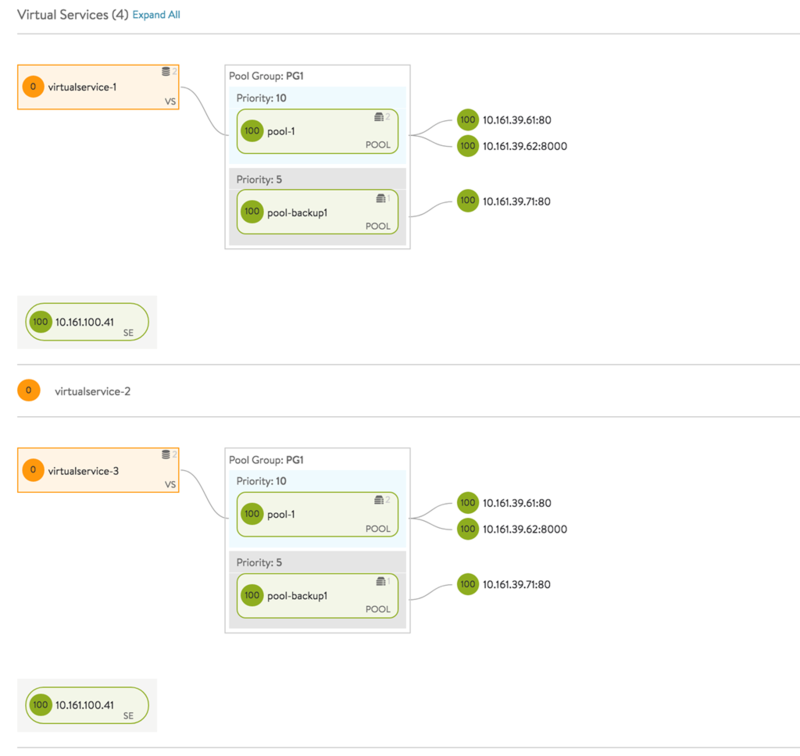 You can see the ability for a single virtual service to be associated with multiple pool groups.